Mbira master Musekiwa Chingodza is a leading ambassador of Shona music from Zimbabwe. He is considered to be one of the world’s finest players of the mbira, an African musical instrument that consists of a wooden or gourd resonator and a varying number of tuned metal or wooden strips that vibrate when plucked. Musekiwa was born into a family of great mbira players in Mwangara village, Murehwa, Zimbabwe, in 1970. He began by teaching himself to play mbira at age five. Through listening to other great players, he developed a strong attachment to and love for mbira music. About his musical tradition he says, “Our music is both medicine and food, as mbira has the power to heal and to provide for people. 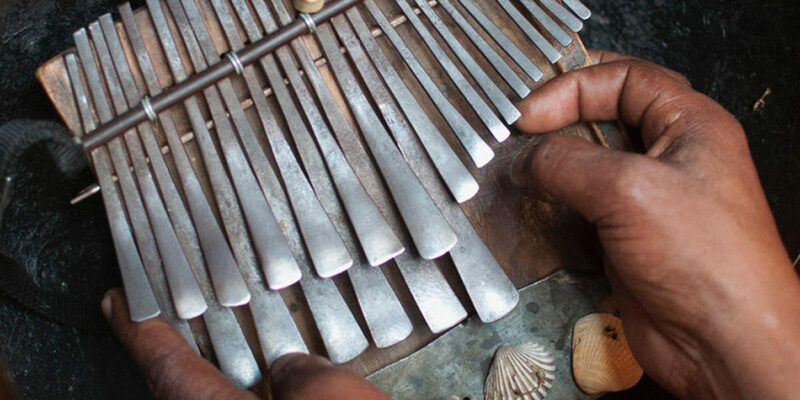 Mbira pleases both the living and the dead.” As a performer, Musekiwa was a key member of the band Panjea and composed the hit Zimbabwean song, "Ganda." Musekiwa taught traditional music for many years at Prince Edward School in Harare. As a singer, dancer and drummer in the Shona tradition, he excels in playing mbira dzavadzimu, hosho (gourd shakers), and nyunga nyunga mbira. Musekiwa is currently on tour in the U.S., and will be performing and teaching in the New York area Oct. 11-20. Below is a list of gigs. For a list of mbira, singing and hosho workshops, contact norabalaban@gmail.com. For mbira, singing and hosho classes with Musekiwa.